Martin Peters MBE was born in Plaistow, London, in 1941. He signed as a football apprentice with West Ham United in 1959, and made his debut in 1962. Peters struggled to retain a regular place in the very strong West Ham team and it wasn't until 1965 that he fully established himself there. 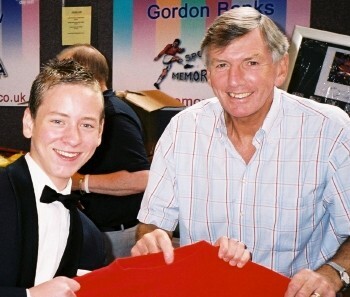 I met Martin Peters at Memorabilia, which was held at the NEC in August 2005. He signed my England football shirt and then I had my photo taken with him. 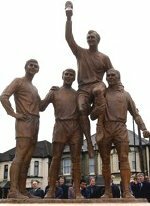 A statue by Philip Jackson was unveiled in 2003 in Green Street, near to the West Ham ground, and depicts Bobby Moore with the World Cup trophy, and team mates Martin Peters, Geoff Hurst and Ray Wilson. Peters' final move was to Sheffield United as their player-coach, soon taking over as manager for the last 16 games of the 1981 season, but resigned when they were relegated. 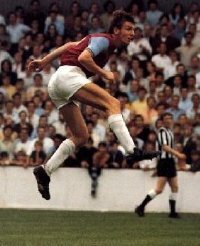 Martin Peters left football and went into the Insurance industry, after playing a total of 882 games and scoring 220 goals. After 189 league games (46 goals) for Spurs, Peters' next club was Norwich City where he stayed until 1980. He made an immense contribution for the Canaries at the Carrow Road club, with 206 league appearances and 44 goals. Martin Peters played at West Ham until 1970 when he left, after making 302 league appearances and scoring 81 goals, to join Tottenham Hotspur for £200,000 plus Jimmy Greaves. In 2006, his autobiography The Ghost of 1966 was published. The cover picture shows him after scoring his goal in the World Cup final. Peters, whom Ham manager Ron Greenwood described as being "ten years ahead of his time", played in the 1970 World Cup matches in Mexico, but after that, England went into decline although Peters did captain them against Poland in 1973. In all, he played 67 matches for England and scored 20 goals. Although Peters didn't play in the opening Group match against Uruguay, he impressed with his hard work and imaginative play in the subsequent games and was included in the team for the Final. He was one of four 'midfield' players whose main job was to supply the passes for forwards Hurst and Hunt to score. They also had responsibilities to help out the defence at times, as well as scoring goals if the opportunity arose. Peters took advantage of just such an opportunity to score England's second goal in their 4-2 win over West Germany. 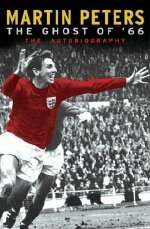 In May 1966, Peters played his first game for England against Yugoslavia, and impressed manager Alf Ramsey with his attitude towards the game. He eventually made the World Cup squad alongside West Ham team-mates Bobby Moore and Geoff Hurst.